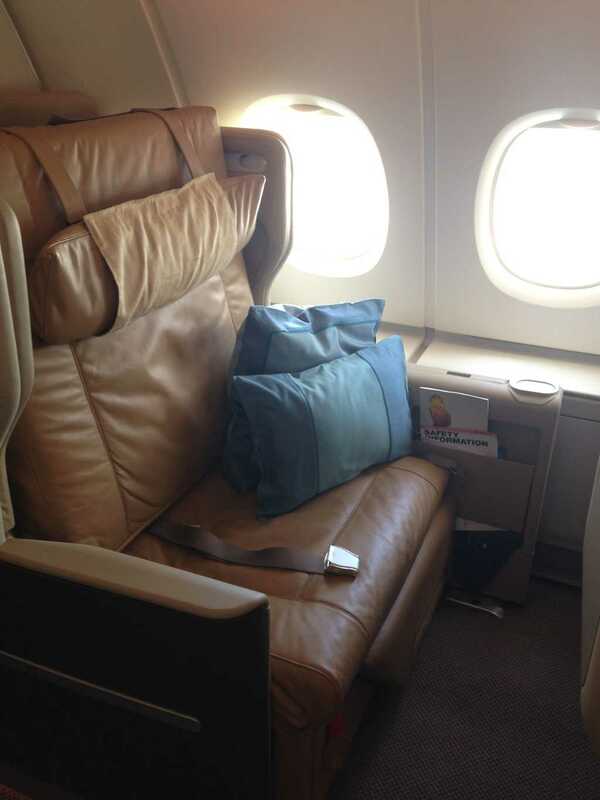 I had flown Singapore Airlines A380 in Business Class a couple of years ago and I must say that the experience has remained unchanged, save for some minor hiccups. Let me share my review. As usual, I make the best use of my miles and keep them for long-haul flights when Business Class makes sense and this was a perfect opportunity. After 3 weeks across the South Pacific in New Zealand, Tahiti, Bora Bora and the Cook Islands I was flying back home from Auckland. 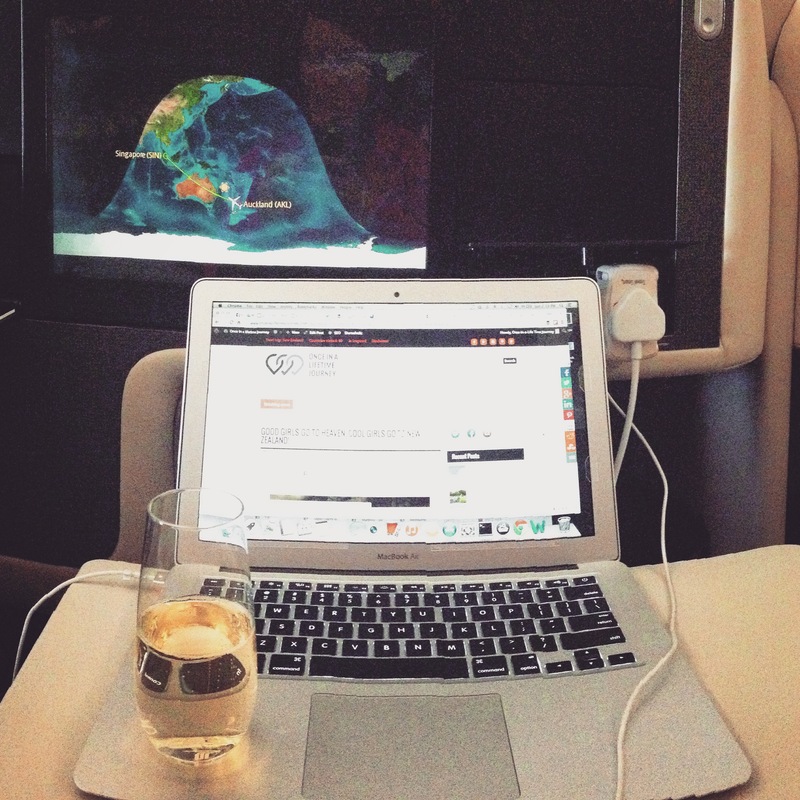 Flying long-haul and in business class brings back tones of memories for me. And, inexplicably, it mostly transports me back to Africa. Perhaps it is because that is where my long-haul traveling started, or because spending so much in hard places meant hat boarding a plane was like being one step closer to home. Or simply because when you are so much on the road you crave a degree of consistency to keep sane. Emirates and Singapore Airlines have this soothing effect on me. Planes are my home, a place where, for a long time, I spent longer than at my own home. Check in at the airport was the usual affair. There were First and Business Class queues without any other passenger so I went ahead and checked-in very quickly. Since Singapore Airlines is part of Star Alliance you get access to the Air New Zealand lounge. The lounge is spacious, airy and bright with windows looking onto the runways. I find it particularly pleasant because it does not have the all too common dungeon feeling of some lounges. The sun is shinning outside and it does feel a bit as if we are sitting at a terrace. The food selection includes cakes, salads, finger sandwiches, soups with condiments and the usual suspects in terms of drinks. The quality of the food is quite high by lounge standards and rends homage to New Zealand’s fresh produce and tasty raw materials. What I found particularly interesting is the coffee corner with a professional barista ready to make your drinks. I have not seen this at any other airport so kudos to Air New Zealand for the novelty and for saving us from the terrible airport coffee machines. Apart from the common low sofas there are also a couple of long communal tables with low stools from where to work. Plugs are easily accessible and visible. The lounge was full but not crowded. At the time of boarding we were called out and I headed towards the gate. Auckland Airport is not very big so the walk is never too long. On the last travelator I could see the plane at the end of the air bridge. The A380 is such a huge plane and it looks even more imposing next to all the other regular A320 and even Boeing 777 maneuvering around it. As I approach the entrance the usual stewardess greets me and indicates my seat is on the right aisle. There is always a touch of nostalgia and warmth when I board a plane from Emirates or Singapore Airlines. After so many years off taking one on a weekly basis they do make me feel like I’m closer to home. I am one of the first passengers to board so the aisle is still empty. My seat is the last one in the Business Class section but there is the entire bathroom area behind my seat between Business and Economy. The galley or the bathroom areas are never a problem because your noise cancelling headsets would compensate for any potential nuisance. As expected, the stewardess comes shortly after I’m seated to offer me a drink. I obviously can’t let a champagne opportunity pass. Although I will shamefully admit that I am not a big bubbles person. After the drinks I get offered the usual Singapore Airlines magazine and newspaper selection. There are magazines on every topic from golfing to fashion and given that it is a long flight I pick a couple which easily fit in the side pocket on my seat. 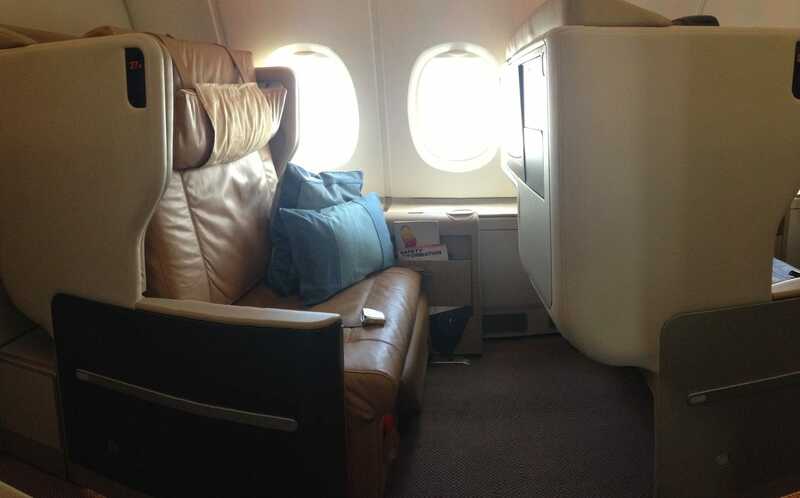 Singapore Airlines A380 configuration is a 1-2-1 with extremely spacious seats. They are so wide that two people can seat next to each other. 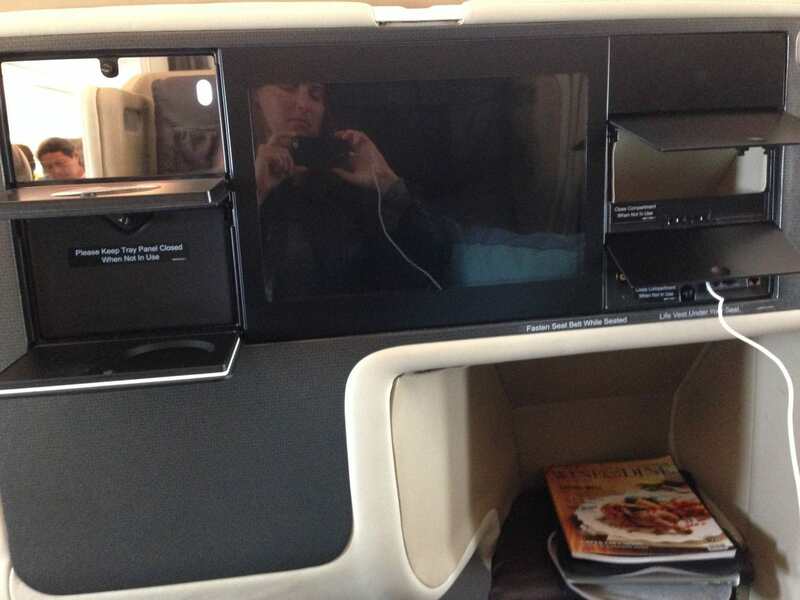 In fact, Singapore Airlines Business Class seats on the A380 are the widest in the world, and when you seat on it you are sure that is the case. Having flown this aircraft before I know that I can easily bend my knees and sit in lotus position and still have plenty of space on either side. On to the storage. The bulkhead storage is very large and with the fewer seats you are guaranteed not having to spend time finding a place to store your hand luggage. Even if the overhead compartments were full I am pretty sure the stewardesses would rush to help. In terms of where to store your belonging that you want to have handy throughout the fight the space under the TV screen and the seat in front of you is so large that it could perfectly store my hyper large handbag stuffed with all sorts of electronics. And trust me, that is no mean feat! Moreover, if you are seated by the window you will have extra storage by the wall under the window where they have designed some lockers. The back of the seat in front has a few compartments that come in handy. There are two pouches for keeping phones, one with a small mirror and one to hold your drink. There is a also a set of plugs and chargers which come in handy. Needless to say the seat is made of leather. If you are tired and prefer to sleep the seat turns into a full flat large bed. It is one of those seats that turn into beds, rather than stretching out, by flipping down the back of the seat. Your duvet and mattress are hidden behind your seat. Although this is great when you are sleeping, it is not so great in terms of lazing around as the seat is not very good at becoming three quarters flat: it is either in sitting position (slightly stretched out) or fully flat. Since mine was a day flight and I was landing only at 7pm I preferred not to sleep to counter potential jet lag so I spent some time watching a couple of movies and writing away on the blog. We take off on time. Singapore Airlines A380 service is slightly different than that of their other aircrafts. The food service starts with a selection of satay with peanut sauce, onion and cucumber accompanied with your choice of drink. The menu has 3 options for starter and 3 for mains featuring meat and fish. I select salmon for both starter and main for lack of a better choice. I didn’t want to have any of the heavier meat options and the same fish was available for starter and main. The entire meal service goes as expected. We do not wait too much between dishes and we are offered different wines often enough. My glass does not get empty without prompting an offer from the crew. Singapore Airlines food is not the best. It is not bad but it is not exceptional either. It sits somewhere in the middle where you can tolerate it and its flaws get masked by some nice touches (like ice cream and wide drinks selection) but it is not something to write home about. 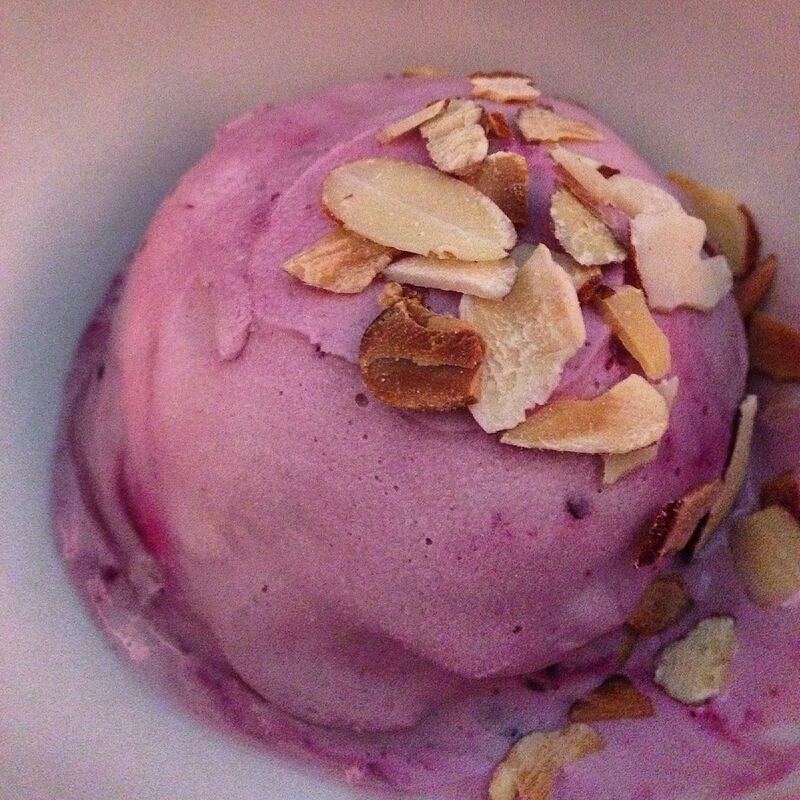 In this particular case though, the desert selection exceeds expectations. We can have a sort of cheesecake or strawberry ice cream. Obviously, I choose the ice cream which is extremely creamy. But deserts don’t end there, there is also a large cheese cart with fruit and crackers to choose from. I over indulge and remain full for the rest of the flight. The size of the seat is not equal to the size of the tray so if you are using it you will have to sit right by the side of the seat. It is nonetheless a large enough tray table to keep my laptop and have space on either side. For such a long flight (12h) there is only one meal service. Snacks and other hot options (like instant noddles) are available throughout but I found it a bit strange that they did not offer a second service. Nonetheless, I had eaten so much that I was not hungry at all. To give them credit, the plane departs at 1pm New Zealand time and lands at 7pm Singapore time so the first meal is lunch but not sure what the second one would be. On this I have to start by saying that I am an ultra-frequent flyer with the Middle Eastern Airlines and once that “happens” to you everything else falls short. However, Singapore Airlines is at the same level if not higher. They are very attentive and try to anticipate needs. I tend to wear my headsets almost throughout the fight because there is something terrifyingly silent about being in such a huge aircraft and hearing nothing more than the entertainment system or your own breathing. It is both eerie and impressive. By wearing the headset it almost gives them the sign that I do not want to be disturb, it is like hanging the Do not Disturb sign by the door but occasionally, when my head detaches from my laptop screen or the TV there is always a member of the crew around. I wonder if they have cameras checking out the cabin and the passengers because it is as i they are reading my mind. I get offered drinks regularly and the crew checks up on me whenever I come back into the world of the cabin. When I compare Singapore Airlines service with that of Emirates, Etihad or Qatar Airways the difference is perhaps on the crew’s diversity and age but that is compensated by their experience. Most of the senior members of the crew on Singapore Airlines have been working for the company for decades and that is obvious in the calmness and graciousness with which they treat you. They behave and address passengers as if they were butlers addressing royalty and you certainly feel like one. Just like with the service level the entertainment system of Singapore Airlines is on a league of its own together with the top notch Middle Eastern Airlines. The movie and TV series box sets is wide enough for you to always have options and it changes monthly. Even when I was traveling on a weekly basis I still managed to find programs to watch. And if the silly TV programs are not your thing Singapore Airlines also offers a wide range of documentaries, games and even learning options. And if you just want to listen to music they have a pretty good selection too. This is something that I find an interesting choice for the airline. No matter the duration of the flight or the time of day or night Singapore Airlines does not give out amenity kits. To tell the truth I accumulated tens of them through the years and I ended up giving hem to charity because I find cosmetics a very personal choice and i can’t think of any girl using the airline one, even if they are Bulgari. You will get eye shades and socks and the rest of the amenities like tooth brushes and alike are available in the toilets so you do get them they are just not wasted away. Considering this is a differentiating factor for other airlines I’ve always found it rather interesting that they chose not to play on that aspect. I am used to flying Singapore Airlines so I have a high regard for the airline. However, there were two things which were slightly annoying. Firstly, I wanted to plug my laptop but the plug did not seem to work. We tried several times, we rebooted the seat and eventually I had to borrow an adaptor from the crew. Secondly, it was announced that the plane had Wi-Fi however, when I tried to login it recognizsed the network but it did not let me connect to it. After trying a few times I called the crew who checked and confirmed that somehow the Wi-Fi service was not available. I must have been the only person in the entire flight who tried to connect because by the time I asked we were half way through. The crew was gracious enough to give me a free voucher for 15MB to use on my next flight. Internet was not crucial so it did not negatively impact my experience but it was a pity. 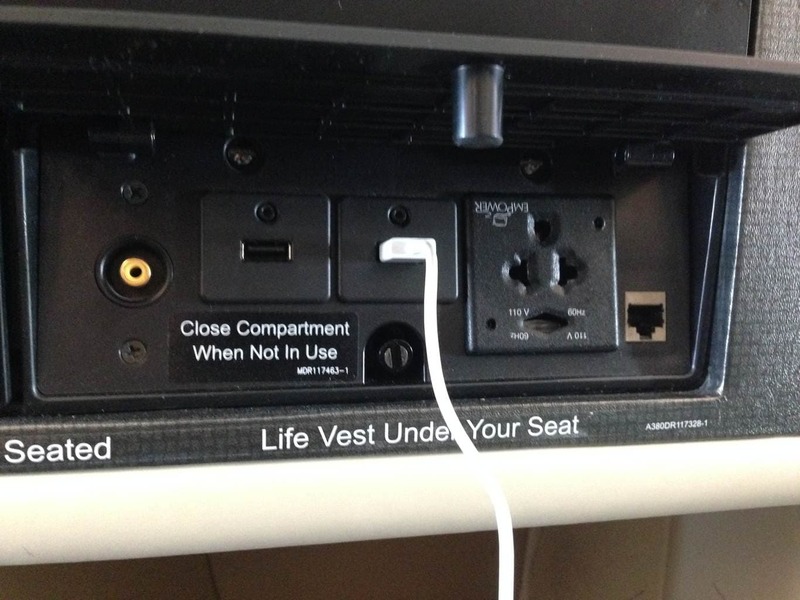 Singapore Airlines does not disappoint. It delivers as expected, does not exceed, does not disappoint. Admittedly I have flown them so many times that there is a much higher chance of being disappointed if the quality is not as extraordinary as usual that it is almost impossible for them to surprise me. All in all, Singapore Airlines A380 Business Class is an excellent aircraft, service and attentive staff so definitively the right choice.